- Measures: Width: 162 cm Depth: 056 cm Height: 220 cm Weight: 650 kg - 2 year Guarantee! - Free Shipping! 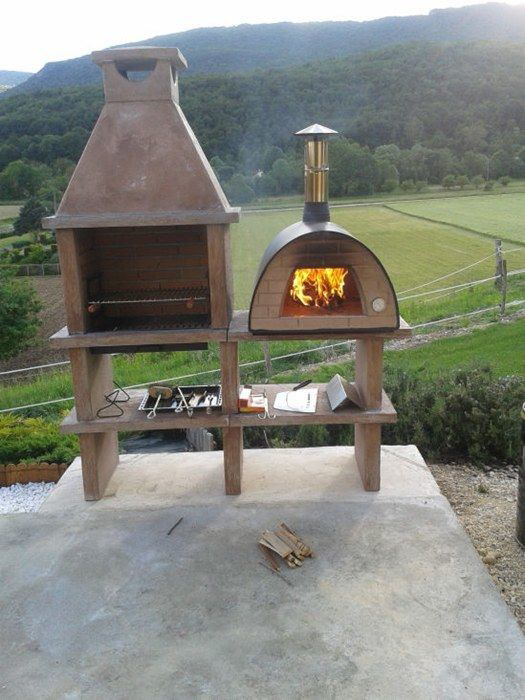 The oven can be on the left side or on the right side of the Barbecue. The price keeps the same! Masonry BBQ with oven AV140RF. Free shipping to England, metropolitan France*, Monaco, Belgium, Luxembourg, Italy and Spain. For other destinations please contact us. "Easy Pork Chops with Apple Butter"
Make light incisions in a criss-cross pattern on one side of the pork chops. Brush the chops with olive oil and place on a plate scored side upwards. Squeeze over the lemon juice and push the garlic into the incisions. Leave for about 20 minutes. For the apple puree, peel and chop the apples into small pieces. Melt the butter in a saucepan over a moderate heat. Add the apples, cover the pan and cook down until the apples have softened. Sweeten with sugar to taste. Using an electric stick blender, process the apples until smooth. water to thin down the apple sauce. Leave on one side while you fry the chops. Heat the BBQ to a moderate heat and season the chops with salt and freshly ground black pepper. Cook the chops, scored side upwards for about 5-7 minutes on one side – until slightly charred and crisp. Flip the chops over and cook for a further minute. By this time, the chops should be tender and cooked through. The shorter cooking time helps stop the garlic from burning. Remove from the BBQ and serve.